While planning my trip to Dubai, my sister in law asked me if there was any particular food I wanted to try. I told her anything but rice and curry. Actually, I wanted to try out Lebanese and where better than where it's made best- after Lebanon, of course! Fortunately, there was Al-Shami restaurant at Sharjah, a hop, skip and jump away from home. Quite popular with the locals, the place was crowded even late at night. There were just too many things on the menu to try out so the family decided we would try out the must haves over 2 visits. On the first visit, we ordered sharwarma, tabbouleh and falafel. In a couple of minutes, the hostess plonked down a plateful of olives, pickled vegetables, hummus and another plate of salad vegetables with a bundle of leaves in the middle. There was a whole tomato, lemon halves, halved Lebanese cucumbers, whole chillies, lettuce and carrot sticks. The bunch of leaves turned out to be rocket- my favourite. The shawarma was outstanding- nothing like what I've ever had. We stuffed the pita pockets with hummus, tabbouleh, falafel and the salad and munched on it. Delicious. 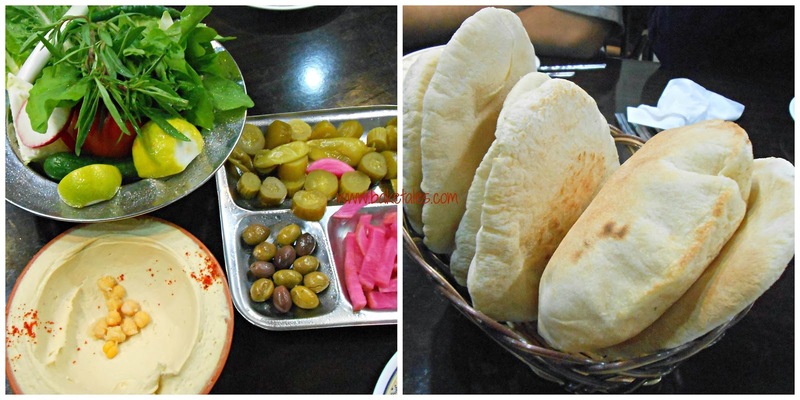 Another day, my nephew took us to Damascus, which he said was the best restaurant in Dubai for Lebanese food. The mandatory salad plate, pita and hummus made their appearances, along with pickled olives and radish sticks. Man, I could just live here and eat nothing but these salads for the rest of my life! The family was most amused at my scarfing down the rocket leaves. Seems they don't even give it a second look. The mixed grill platter we ordered had a bit of everything. The shawarma at Damascus had French fries in it. I think I prefer mine without. If you're wondering what arayees is, it's like a stuffed pita, cut in triangles, crisp and delicious. The staff was quite amused at my clicking pictures but by the end of the meal, they posed for snaps and assured me I could go into their kitchen and photograph the chef making shawarmas. So even cameras can open doors??!! On my last day in Dubai, we went back to Al Shami for lunch. This time, we ordered a plate of grilled chicken mandi- rice with grilled chicken, a light stock, chilli sauce and yoghurt. Really really yummy! And kibbeh- a bulgar croquette enclosing a filling of cooked beef and pine nuts. I just couldn't leave without trying one dessert so we chose mahalabia, made of milk, evaporated milk and cornstarch, garnished with raisins and almond slivers. Nice. I came back with lots of sumac and za'atar. I love sprinkling za'atar over breads- what a fabulous taste. That inspired me to try out M'sakhan, a Palestine inspired roast chicken. Clean and dry the chicken with kitchen towels. In a glass dish, combine garlic, 1 teaspoon each sumac and za'atar, cinnamon powder, allspice powder, lime juice, salt, pepper and the quartered lime. Marinate the chicken in this for about 4 hours. Arrange the chicken in a roasting pan, spread the sliced onion over along with the remaining sumac and za'atar. Place in a preheated 200°C oven for about 30 minutes. Baste with pan juices. Turn over the pieces and roast for another 30 minutes. Serve with pita and hummus. And tender cucumbers, olives and rocket leaves.